*read: official. Did anyone get that or am I low key getting fired today. It’s funny because that’s a Facebook joke, and this is a really fun and big announcement about Snapchat. Because it’s official, we’re in a relationship. 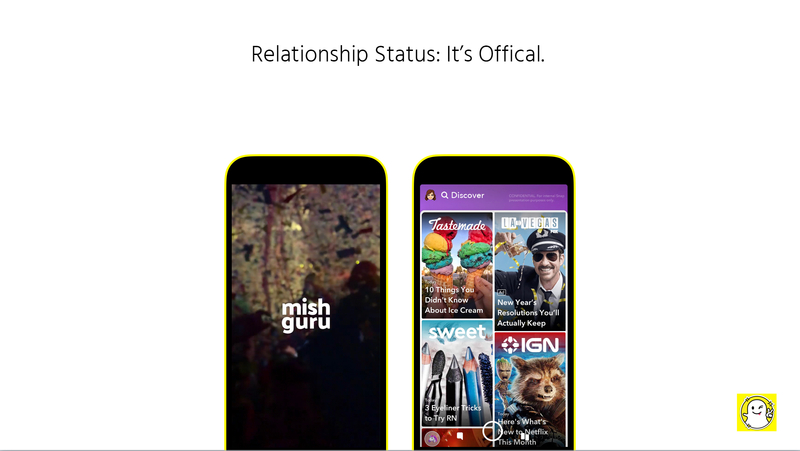 We’re super chuffed, wildly humbled and full fizz (that’s a Mish Guru favorite for ‘pumped’) to announce that we’re now an official Snapchat Partner - certified by the big spooky ghost that is Snap to help brands win on Snapchat Ads. Here’s an announcement in Marketing Land about some of the new releases from Snap in the ramp to the holidays, including - you guessed it - new partners. Take a peek at no. 3 on the list, and join us in collective clapping that’s hopefully better than Nicole Kidman at the 2017 Oscars. That means that stuff we write about all the time… turns out we do know what we’re talking about. Haha kidding, we always knew that - but the official thing is really cool. It’s exciting news BECAUSE we get to help more great people tell really, really great Stories that drive real business results - and get to continue learning how to do that better and better over time. With recent client Story Ad campaigns, we’ve been experiencing a 44% lower CPC than industry standards on Facebook, with CTR and CPM results coming through just as strong. That means exciting times for marketers looking to drive direct results through social -- if you can get the creative right. More on that below. So, we know this blog usually contains a bunch of tidbits, musings, and pontification about how we can all make more impact as storytellers - to resonate, to engage, to take action. To really make the Stories we tell mean something to our audiences. But today we wanted to interrupt that for a minute to share this story of our own with you - because as we step back, this is one of those moments that we can say thank you for reading this, for working with us, and for trusting us to help you tell your own Stories. Today that really meant something to us, even more than it does every other day.